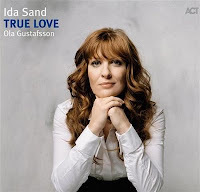 Ida Sand’s second album “True Love” is released in 2009 again from ACT. This time this album is dedicated to love and family because Ida Sand is married and had a baby meanwhile. It is hard to put this album in any genre I know, it is free such as love. Ola Gustafsson’s guitar and a softer, a calmer vocal compared to the first album will meet you. I loved that album because I have seen again that love makes everything beautiful and paeceful. Look at the eyes of ones whom you love when listening to that album. You will learn that there is nothing more important than a home full of peace and love. A really Sunday morning album. For this reason, my review will be a little bit emotional. You will also see some great rock songs as well as a reggae piece in this album. The musicians are: Ida Sand, vocals, Grand piano & Wurlitzer – Ola Gustafsson, guitars – Mattias Torell, guitars – Peter Forss,electric & upright bass, violin – Per Lindvall, drums & percussion - Peter Asplund, trumpet & flugelhorn - Magnus Lindgren, flute&bassclarinet - Ingela Olson and Andre De Lang, background vocals. The records and mixing is made by Janne Hansson at Atlantis Studios in Stockholm. Mastering is made by Klaus Scheuermann at 4ohm in Munich. Ventura Highway: The entrance is nearly a 45 seconds trumpet solo followed by an accompanying guitar playing in two speakers with a small phase and tone difference, which makes you feel like while you are driving alone in an ordinary road, you suddenly entered a forest lane. The trumpet is you, alone. The guitar tones are the trees, the song is the life. The trumpet changes when it meets the guitar and the song changes. You change when you see the trees and life is better. After the first minute Ida Sand’s very soft, intimate vocal is started to gliding over the song like a bird flying over you, sometimes near to you, sometimes away from you. What about the drums? It is time. After the first half of the song the decision is made that life is beautiful, every instrument is very well defined in the stage playing in a great harmony and Ida controls the tension not only by her dynamic vocal but also with her piano. Notice Me: This song is composed by Ida Sand. First 10 seconds look like a start for a hard-rock song, however with the soft touches of the guitar followed by the consistent soft vocal of Ida what we listen to resembles a smooth-jazz song. Take a cup of coffee! Ida used a Wurlitzer in this song instead of a piano. The Weight: A brave blues guitar entrance is followed by a near whispering vocal of Ida. Afterwards, in the high-tension part, Ida showed us what a strong vocalist she is. A very difficult partition is successfully performed with no fear. I have been listening to most attractive “Put a load on me” pronounciation. In every level Ida rises the tension further more. You will ask yourself wait a minute, can she do that again. And you will see she can. You should really give attention to the hot guitar tone. The drums’ attacks well-fit with the tension all over the song. My Biggest Fear: Ida said in İstanbul concert that her biggest fear were snakes. But in her own song we learn that her biggest fear is loosing her love. Besides Ida’s soft vocal accompanied by soft touches of piano, a great violin (sometimes solo, sometimes behind her vocal) tone of Peter Forss makes this song a very emotional one that covers you like a blanket made of silk. As Long As You Love Me: Another love song of this love album performed by a lovely, soft vocal of a woman probably in love. This song is composed by Ida. Devil’s Game: Ida’s great composition’s guitar performances should be taken attention. The vocal of Ida Sand, at first, gave me a similar feeling that I get when listening to Tina Turner. Try to listen the perfect vibratos when the bass and drums are silent. In this song I learned again that tension and “beats per minute” are independent terms in music. In this such a slow rhythm these perfect musicians give us an excellent example of it. Lastly, try to catch the Ida’s last breathe taking. In past, some of the perfect jazz singers sing not only while breathing out but also while breathing in. This makes them to create a continuous and fluent performance in which there is no breathing-in sounds. Especially when scatting, when singing solo or singing in a fast tempo this is a beneficial talent. Ida can do that. That’s last breath-out, I think, proves that. Heart of Gold: A great rock song of Neil Young that we are so used to listen from his soft male and delicate vocal. You can say that I am exaggerating but trust me Ida sings it as wonderful as it can be. It is certain that she had listened to it long enough. The guitar tone is soft and smooth. Especially listen to the entrance of the song for the guitar once more. I am so excited to hear deeply recorded kicks of the drums. Great. Also perfect background vocals accompany Ida in some part of the song. Manic Depression: This masterpiece belongs to the king, Jimi Hendrix. No need to say anything about him here, everybody knows it. If you do not know please click on “Cancel”… Forget it, I’m joking. I think Ola Gustafsson has a real rocking effect on Ida Sand or she really has chosen to be a rock star. Look out the great tone of bass clarinet of Magnus Lindgren in the whole song. I think, since the whole instruments are on the lower octaves, Ida sang this song on a higher octave. Although it is very difficult to go on singing the whole song in that way, Ida’s voice has a lot place to go and she can do it. Loverman: A dialogue of trumpet and Ida’s vocal met us in the beginning then her piano begins as soft as her vocal. A very relaxing song from beginning to end, feels you like you are in a romantic Hollywood film looking to the sunset at the balcony of a ball room. Who’s Gonna Help Brother Get Further: This is the last piece with a fast tempo in the album before the end. I think Ida gives the most assertive vocal performance in the album. Check the great technique she used to give lower frequency tones using her nasal space. Again the drum records and performance is state of “ART”. There are some back vocals which are well-fit with Ida Sand’s vocal. Redemption Song: This is another “one of the most important songs of my life” not only for its lyrics and meaning but also for the great reggae musician Bob Marley. This song is a once-a-week song for me. I think it can be classified as classical music because the messages are universal and timeless. Sometimes there is no need to make any comment for the cover. Listen to this song once again this time from Ida Sand. True Love: Here comes the last song having the same name with this album of love. We hear the wonderful flute of Magnus Lindgren in this song. The lyrics are very critic for this song to be fully meaningful to you. Ida Sand basically explains what true love is. I totally understand what she is talking about ‘cause glad to say I have it. It is a perfect choice to be the last song giving the main theme, that love and family is important and must be true, deep and strong. Ida shouts this to your face silently with her incredible vocal in the last part of the song. The vocal are well focused, all layers of the vocal is easily heard. The placements of the instruments on the stage is perfect. The bass records are very organic and acoustic.